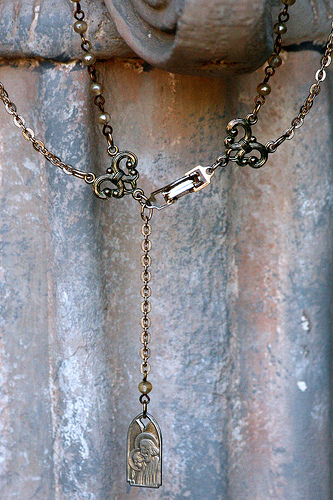 My Mother My Hope-vintage necklace, originally uploaded by Temeculamom. What I’ve been doing with my sleepless nights. 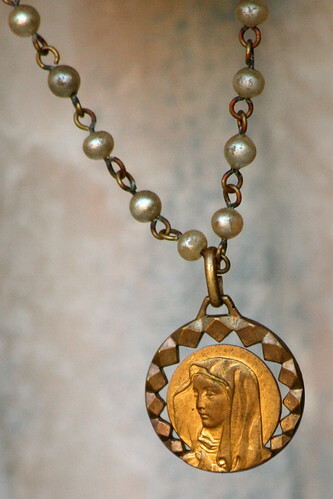 I’ve been collecting vintage jewelry bits, rosaries and religious medals for quite a while, not knowing quite what to do with them. This past couple of weeks I have had a bad case of insomnia, so I bought myself some tiny pliers and set to work taking things apart and reassembling them. This is my favorite one. It’s got two tiers, and I just love the mix of colors and materials. I also like the “My mother, my hope” saying, which is hidden behind like a secret message, close to your heart. I made several more (not as ornate), but haven’t photographed them yet. It would help if I had a model. If I can get my act together, I will try to put them on Etsy. ~ by bekaboo on February 17, 2007. Those are very beautiful, Beka! Thank you for leaving a comment on my blog. I am a big fan of Pooh Bear. I love your necklace it’s stunning. I have to say I am impressed you got your car back. I love the card that your daughter made you. Love the song she sang to you as well. Too cute. You’re Very talented Mizz Beka!